Documented throughout history as Alunno di Domenico, which means Pupil of Domenico, as in Domenico Ghirlandaio (1449 – 1494), Giovanni was a talented artist in Ghirlandaio’s workshop. He is most famous for his contributions in Ghirlandaio’s commission at the Ospedale degli Innocenti (Hospital of the Innocents), a children’s orphanage in Florence. The work Ghirlandaio commissioned Giovanni for in 1488, was for the predella panels for the altarpiece, Adoration of Magi. It is also rumored that Giovanni also trained some under Sandro Botticelli (1445 – 1510). It has since been noted, that he also made an impression working on Ghirlandaio’s commission from Pope Sixtus IV for a wall fresco in the Sistine Chapel. The Ghirlandaio piece is titled, Christ Calling Peter and Andrew to their Apostleship. 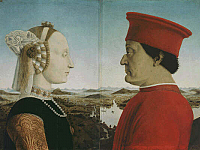 Some critics have mentioned a unique style in Giovanni that distinguished his work from Ghirlandaio, calling it intense, almost in the style of the Nordic Painters and that of Florentine artist, Piero Di Cosimo (1462 – 1522).